Puʻu ʻŌʻō Trail, part of the state’s Nā Ala Hele trail system, visits several kīpuka, which are areas of old-growth forest spared between lava flows. This trail crosses many of these islands of life as it snakes through rough ʻaʻā lava from Mauna Loa, looming above. It has nothing to do with Puʻu ʻŌʻō in Hawai’i Volcanoes National Park, the current site of the Kīlauea eruption. 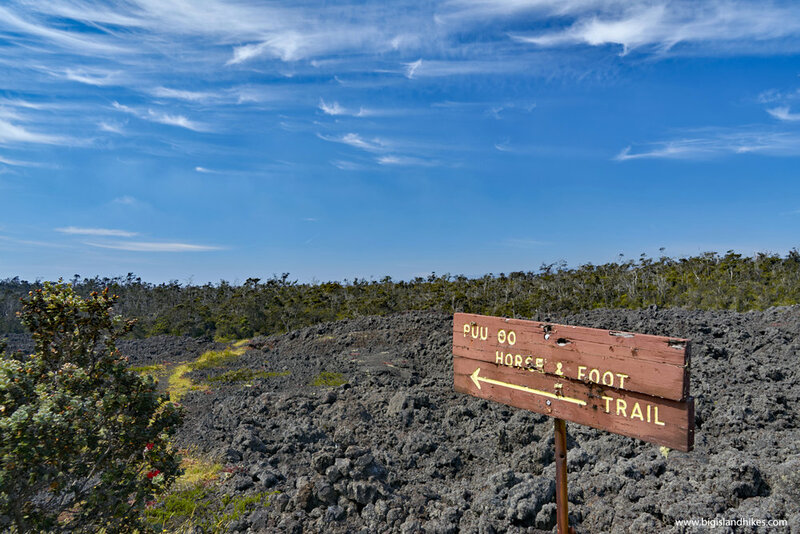 The name comes from older times when this trail used to be used to drive cattle between the Puʻu ʻŌʻō Ranch on Mauna Loa and other range on the slopes of Mauna Kea. The kīpukas along the Puʻu ʻŌʻō trail are also host to several species of endemic birds, making this location popular with birders and photographers. This hike also allows you to visit a pristine lava tube in a wilderness area. You need a permit from the State DLNR (see below). This area is managed by the state Division of Forestry and Wildlife. Archery hunting (no rifles) is permitted only on weekends and state holidays from March through October. Dogs are not allowed. Trailhead: Coming from either direction on the Saddle Road, Hwy. 200, find yellow traffic signs marked with “Puu Oo Trail” (in both directions) between the 22 and 23 mile markers. Pull off the road and park in the small gravel lot. If you want to begin at the Powerline Trail parking, drive about one mile to the east from the Puʻu ʻŌʻō Trailhead and turn onto an unmarked dirt road. Park in an appropriate place along this road that ends at a Forest Reserve gate. Don't try to drive past the gate. Gear: This entire hike is over 5000' above sea level, so you'll need proper clothing for cool weather hiking and sturdy boots. Don’t forget the rain gear. Hike: Beginning at the Puʻu ʻŌʻō Trailhead, follow the well-marked trail through some sparse vegetation. The trail follows large ahu (cairns) and alternates between crossing barren lava fields and kīpukas. The trail is easier to follow closer to the highway, and gets more difficult as the kīpukas become spaced further apart. Use your map and compass to stay on the right track. If you get confused, especially in a barren lava field, immediately reverse and retrace your steps until you find the proper trail. After about four miles, the Puʻu ʻŌʻō Trail intersects a four-wheel drive road unoffically called the Powerline Road. There are no more powerlines remaining along the road, but you can still see several stumps where it once ran. If you intend to do the big loop hike, turn north here and follow the Powerline Road back to the Saddle Road, and then hike the road back to your car at the Puʻu ʻŌʻō Trailhead. Doing this loop requires you to walk along the Saddle Road for nearly one mile. There is a wide shoulder, but it’s still very dangerous to walk the road. Take extreme care - the speed limit is 55 and drivers aren’t used to pedestrians along the Saddle Road. Emesine Lava Tube: This lava tube remains in a relatively pristine state, mostly because it is difficult to locate on Forest Reserve land on the middle of the island. You need to obtain a permit from the State Department of Land and Natural Resources. Call 808-587-0166. If you've never been inside a lava tube, this probably shouldn't be your first. Read about lava tube hazards. Emesine Lava Tube is located 0.5 mile north of the intersection of the Powerline Road trail/road and the Puʻu ʻŌʻō Trail. Find the entrance about 20 yards to the west of the Powerline Road. The lava tube travels quite far to the east, but not that far to the west.